Former Super Eagles midfielder Ifeanyi Ekwueme last weekend in his hometown of Nguru, Mbaise in Imo State laid his father Chief Eugene Ukazu Ekwueme to rest in style, in a beffitting burial that drew the high and mighty from far and near to honour the departed philantropist. Ifeanyi stormed the wedding with friends and well wishers, amongst them many players current and retired. Notable figures like Karibe Ojigwe, Ekenna Nnado, Collins Zigima AMadi, Kema Killiwe Nwachukwu and dignitaries like Bongo music exponent Saro Wiwa, representatives of Imo State governor Owelle Rochas Okorocha, top Nigerian sports lawyer barrister Johnny Precious Ogbah, Love FM Umuahia's El Kino and members of City Men United FC of Umuahia notably Ikenna Tigana Njoku, Georgee Uwalaka, Dauda, Tony Oguejiofor and KC Echeta. The event which was heavily attended brought a lot of tears to the eyes of guests as the amazing qualities of Chief Ekwueme were being read out during the funeral mass at Sacred Heart Catholic Church Nguru Mbaise. "My father was a sports lover and philantropist," Ifeanyi revealed to allnigeriasoccer.com. 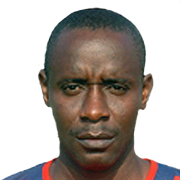 Even after he retired he became the patron of Ekwueme United FC and through his involvement many players were able to forge professional careers abroad. We will certainly miss him."